Most American children consume about 32 teaspoons of sugar a day. That’s over 3 times the recommended limit! Many of us adults aren’t faring much better. Trouble is, it’s hard to cut down your children’s sugar intake without seeming like a party pooper. The good news is, you can still spoil them with healthy cookie recipes that leave out the bad stuff while maxing out on the good. So, ditch the expensive and over-processed food. Rather try your hand at these easy-to-make-delicious-to-eat treats. It’s the right thing to do. These healthy oatmeal cookies are heavenly in every way. They’re divine to snack on and packed full of pure goodness. Break up the bananas and oats in a food processor and then add the rest of the ingredients and blend until smooth. Scoop spoonfuls of batter onto a baking tray lined with parchment. Add some toppings if you like. Small berries, nuts or coconut work well. Bake the cookies for 12 to 14 minutes. You can break one open to check if they’re done. You may have noticed that this recipe has no sugar, no dairy, no flour, and no eggs. Plus, oat and banana calories are minimal when compared to the health benefits of these ingredients. This quick and easy mini recipe makes just 6 cookies, but when something’s this good you don’t need more of them. If you want extra, double the quantities – no harm done. Grind the oats in a small bullet blender or coffee grinder and mash the pumpkin and bananas together. Combine all the ingredients and blend. Scoop spoonfuls of the dough onto a non-stick baking tray and bake the cookies for 20 minutes. These cookies keep for up to 3 days in the refrigerator but it’s unlikely they’ll be around for that long. You can never have too many spiced cookie recipes. There’s more information here on another gluten-free version of spiced keto cookies. 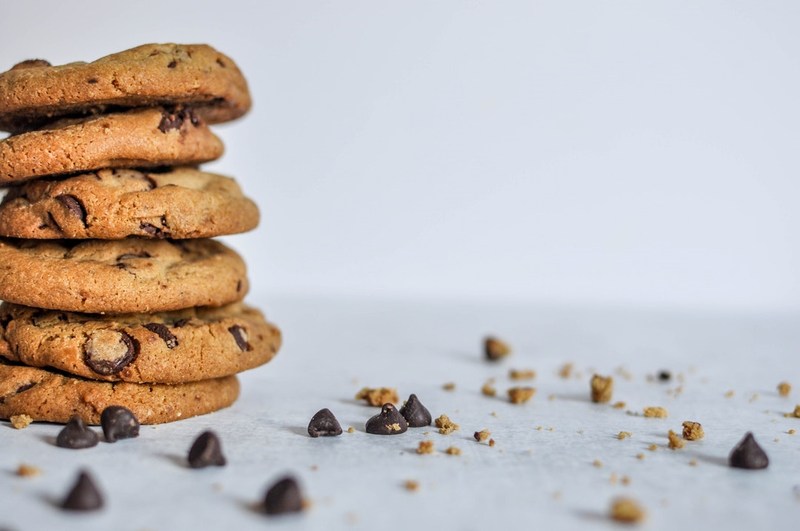 This is one of the best cookie recipes for teaching your children that it’s possible to enjoy their favorite snacks in a healthier way. Mix the first five ingredients together in one bowl and the wet ingredients in another. Add the wet ingredients to the flour mix and combine well. Put the dough in a plastic bag and refrigerate for 30 minutes. Cut it into circles using a cookie cutter. Place the cookies onto a non-stick baking tray and bake for 10 minutes. Allow them to cool for 10 minutes while you mix the filling ingredients together. Sandwich the cookie disc together with the filling and refrigerate. These cookies are best kept in the refrigerator between feasting sessions so that the filling stays firm. No list of cookie recipes is complete without chocolate chip cookies. Here’s how to make a guilt-free batch of these popular treats. Mash the banana until creamy using a mixer then blend in the chia and flax seeds. Add the protein powder and peanut flour and mix until just combined. Fold in the chocolate chips with a spoon. Scoop the dough onto a baking sheet lined with parchment paper and press them down with the palm of your hand. Note – these cookies do not spread in the oven. Bake the cookies for 8 to 9 minutes until firm. Remove the cookies from the oven, place them on a wire rack and allow to cool for 10 minutes. These protein-packed bites are perfect lunch box eats for busy kids or as a post-workout snack for you. Peanut butter is the hero of many healthy-eating snacks. In this recipe, it’s the star of the show. Combine all the dry ingredients in a bowl and stir until smooth. Add the rest of the ingredients and mix into a firm dough. For softer-textured cookies, you can refrigerate the dough for an hour at this point. Roll the dough into evenly sized balls and place them on a non-stick baking tray. Flatten them with a fork. Bake the cookies for 8 minutes and leave to cool on the tray for ten minutes. You may have noticed that this is a vegan recipe but don’t knock it till you’ve tried it. The apple sauce ensures that you don’t mourn the absence of butter or eggs in the mix. These bites taste just as great as the old-fashioned peanut butter cookies we know and love. Healthy cookie recipes are just the start of living a healthier, better life. You can adjust almost all your favorite recipes to include healthy ingredients. Keep experimenting with better eating options when preparing your daily meals. Let us know how it goes in the comments box below. You’ll find plenty of inspiration in the recipes section of my blog, or you can sign up for my weekly newsletter for regular updates.